The 2013 Young Authors’ Book Project is here! 826 Valencia is gearing up for our biggest student publishing partnership of the year—the Young Authors’ Book Project. 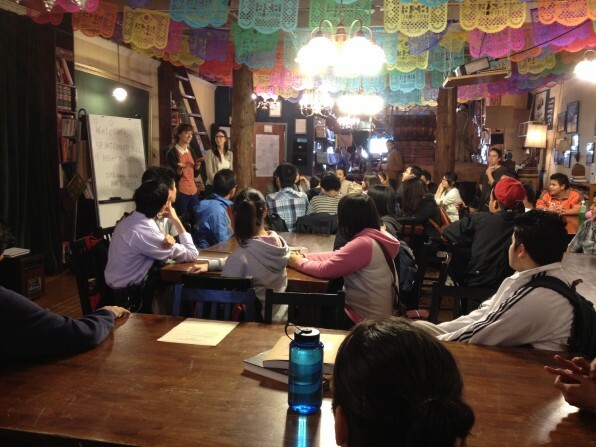 On Friday, December 7, four classes from International High School visited 826 Valencia for the kick-off celebration of the 2013 Young Authors’ Book Project. By May, these juniors will have completed months of rigorous writing, revising, and editing and will be published authors. During the kick-off, 826 staff welcomed the classes and shared the process for the coming months. This year, the students will write moving essays on the themes of identity, communication, and assimilation. 826 Valencia tutors begin classroom visits in January! If you have availability from January 8 to February 14, get involved with this rewarding project.